If a Canadian family adopts a U.S. born child, there are two sets of implications. 1. The Child Him/herself: The fact that the child is a U.S. citizen coupled with the fact that the U.S uses citizenship-based taxation means that the child will have the usual FBAR, FATCA and 1040 responsibilities. 2. The Parents: Assuming that the family lives in Canada with the adopted U.S. citizen, the family will now have obligations to the IRS. For example, if the child has a bank account in Canada and the parent has signing authority over the account (a very common occurrence), both the parent and the child will have to file an FBAR. What if the family sets up a RESP or TSFA for the child? Once again: reporting obligations to the IRS. Furthermore, if the banking or financial institution discovers a “U.S. citizen component” to the family, FATCA reporting requirements may affect the ability of family to continue banking privileges with the bank. (The Canadian Bankers Association has suggested that Canadian banks may have to close the accounts of U.S. citizens.) This is the problem of the U.S. citizenship. One family member who is a U.S. citizen can “contaminate” the whole family. Once this information is well known in the “adoption world”, children born in the U.S. will not be considered for adoption by non-U.S. parents. Parenthood is hard enough. 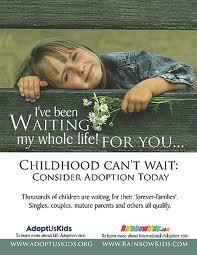 Would you adopt a child if you knew that it included obligations to the IRS? U.S. citizenship – the world’s most toxic citizenship! Renounce U.S. Citizenship and Rejoice! This entry was posted in Citizenship-based taxation, FBAR and reporting, Social disadvantages of U.S. citizenship and tagged adopt U.S. children, FATCA, FBAR, FBAR and RRSPs, renounce u.s. ctizenship, resp, tfsa on December 31, 2011 by renounceuscitizenship. I doubt this aspect would have crossed any of our minds unless we were dealing with it personally. It is sad that these kids may be passed over by potential parents in a country such as Canada. How to deal with the US citizenship aspect for their new child who will be raised in a country other than the US is important to highlight to potential parents and those who have already completed their adoption process. Good God, should these little ones have to come with a warning sticker? The parents may put him on bank and financial accounts as a joint owner, or give him signature authority on financial accounts as they grow older… now what? well, FBAR to start and lots of the parents’ information will be provided to IRS.